Very simple Python / Tkinter GUI to send selected keystrokes via serial port | ad hocumentation • n. fast, instinctive documentation of ideas and solutions. 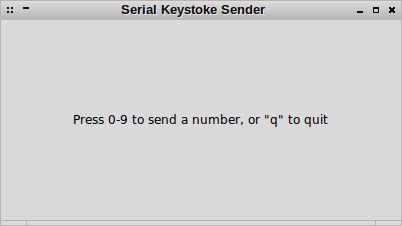 Following a query from Naomi Dickerson, I was playing around with my SerialSend program, which I often use for sending arbitrary bytes or characters to a connected microcontroller circuit. Sometimes, it’s convenient to send keystrokes in real time i.e. each keystroke is sent as soon as the user strikes the key. This could be done in a Windows console using something like getch(), but in this case I’ve chosen to use Python and Tkinter instead, supported by the PySerial module. Python is absolutely great for automating serial port chit chat. I’ve never found anything better for opening, reading, writing and closing a serial port in just a few lines of code. The above code should be cross-platform compatible apart from the serial port name ‘/dev/ttyUSB0’, which is what my USB-to-serial converter appears as here in Crunchbang Linux. In Windows, I think you can either replace ‘/dev/ttyUSB0’ with your COM port name in inverted commas (e.g. ‘COM23’) , or even just a device number (0, 1, 2 or whatever). There are more elegant ways to handle this by configuring file permissions or whatever, but for this kind of hardware hacking I’m happy enough to just sudo it. First of all, you have a very nice blog. Thanks for sharing your knowledge! I don’t have a clue about the version of python used. Is it version 3 for default? Thanks for your kind words! When I wrote this post, I was using still Crunchbang Linux (I’m using Xubuntu now that Crunchbang has disappeared) and I was presumably using the default installed Python version which was either 2.6 or 2.7.